Last year was my first year of university and so the first time when I had a long stretch of time off around Christmas. Inevitably my thrill urges kicked in, it being the theme park off-season after all, and so I was drawn to visit Hyde Park. I had heard about Winter Wonderland from friends and it seemed like a lively, atmospheric Christmas Market with an ice rink and a few fun fair rides, but reviews became more enthusiastic about some of the big attractions and I felt it was time to give it a go. Fast forward a year and I’m in a similar situation; craving thrill rides with plenty of time to spare. So I hit up London’s biggest Christmas attraction again and got my fun on. Winter Wonderland is very easy to get to, and to find. Hyde Park Corner is the best tube station (on the Piccadilly Line), despite the official website suggesting Green Park and Marble Arch above it (I assume this is to minimise congestion close to the entrance), and after a couple of minutes we were walking down Angels Market, one of the two Christmas Markets. There is a huge array of food, drink, clothes and souvenirs on offer. All of the rides are ticketed, so you have to buy the tickets first and then use them to pay for each ride. 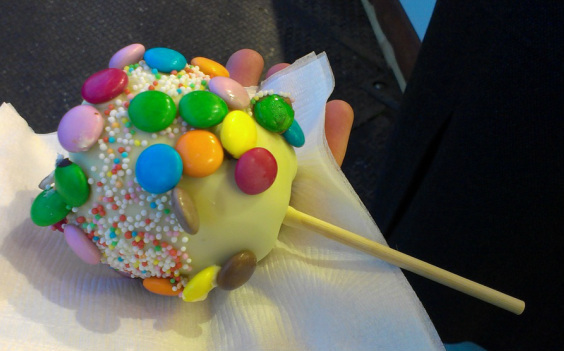 Also, everything is expensive (Last year I spent £10 on pick and mix) so you really have to pick and choose; I forwent alcohol and souvenirs in order to gorge on unhealthy food and the big rides. I have the blessing/curse of a bottomless stomach and so treated myself to churros (my first time, they’re good but not as good as doughnuts) and a chocolate covered apple. If you want to eat a proper meal there are dozens of options, all smelling as great as the next. A select few were: fish and chips, pies, pasties, German hotdogs, English hotdogs, pretzels, roasted chestnuts, curly fries, roast turkey sandwiches, roast pork and wild animal burgers; wildebeest, ostrich, warthog and even zebra. The drink selection ranges from the basic to the festive; there’s plenty of mulled wine, hot cider and hot chocolate. Clearly Winter Wonderland is experiencing some level of success as it expanding every year. Last year seemed like a very large scale fun fair, and this year’s is almost twice the size. Last year there were three large (large considering they’re transportable) roller coasters, this year there are five. They've done away with last year’s Christmas Coaster, which is a good move, but two of the rides they've added are a peculiar choice: when the ride line-up was announced there was mention of an ‘Ice Mountain Coaster’. From the description this seemed to be famous indoor travelling roller coaster Hollenblitz, which travels the German fair circuit and is considered one of the finest transportable rides in the world. Unfortunately this was not the case, and instead the ride is just a regular Reverchon Spinning Mouse (The most common fun fair coaster) stuffed inside a makeshift warehouse to make it look like Hollenblitz. This is no problem, of course; the more coasters the better, but what is bizarre is that right behind the ride they have another, identical Reverchon coaster without the housing. The indoor version seemed reasonably popular, however the other gained absolutely no riders whilst I was anywhere near it. The layout is quite confusing; there are some signs to the circus and ice rink but none to any of the rides. It’s actually just a convoluted ring, so if you set off confidently in any direction you’ll eventually pass all of the attractions. There are simply too many rides to cover them all, or even to go on them all; I spent £33 going on 5 rides, if you were to go on all the coasters and major thrill rides you could easily spend over £80, but it’s quite obvious which the best rides are. We headed around anticlockwise and began with a favourite from last year, Power Tower. It’s a drop tower, and at 216ft tall it’s the highest travelling drop tower in the world. Unlike most rides of its kind it is completely electronic; this means that there is no true freefall, so it’s less intense, and also it has a much longer ride cycle. 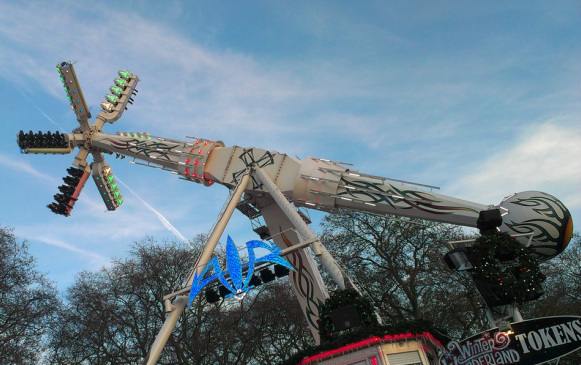 It’s the tallest ride in Winter Wonderland and is pretty intimidating; you get to enjoy the beautiful London skyline for 10 seconds or so before you plunge to the ground. The drop starts off with the typical stomach-turning airtime, but its controlled nature means it quickly backs off; catching you and bouncing you back up the tower. It’s the perfect combination really; it maintains that moment of zero-g, but also makes it a lot more fun. You get three drops per cycle, and usually the operator will send you on two cycles for your £7. Next up was another ride from last year, Wilde Maus XXL. Wild Mouse coasters have become a staple of theme parks, both travelling and permanent, over the last 20 years or so; they’re characterised by numerous hair pin turns and sudden, sharp drops. They’re popular because of the punch they pack into such a small footprint, and Wilde Maus XXL is one of the best examples of the genre in the world. It’s a customised model from Mack; they have literally welded on two large drops to the beginning of a regular ride (The XXL signifies that it’s extra-extra-large), and although it’s not exactly extreme it’s still good fun. The queueline is excellent; it’s done like a fun-house pathway, full of spinning plates, sliding bridges, conveyer belts and trap doors. After a bit of a wander we got on Air, the fantastic Zierer Star Shape. Zierer has taken the gondola design from Mondial’s excellent Top Scan model and stuck it on the end of a huge, rotating pendulum. The result is incredible; three axes of 360 degree rotation, and because of the free spinning nature of the seats the experience varies massively with each go. Some moments provide a floaty and light flying sensation, others are powerful, slamming you into your seat when you get the brunt of the 100ft drop. On top of that the ride cycle is over 3 minutes long which is very welcome. Air is owned by a UK based company and first opened in 2011, at a price tag of £2 million. This is a big expenditure for a travelling company but it seems their bravery has paid off; in my books it’s the best flat ride in the UK, even better than Detonator or Apocalypse, and it’s head and shoulders above everything that isn’t a drop tower. Check out the YouTube channel for a full POV! Thriller is Winter Wonderland’s biggest new roller coaster; a Pinfari RC50 model full of tight turns and twisted drops. It’s a very bumpy ride but isn’t very exciting, it looks a lot better than it is. After the fun first drop it does little more than meander around, and it gives your neck quite a beating whilst it’s at it. After completing a lap of the fair we headed back, and on the way I tried out Blizzard, a Mondial Turbine. The ride is similar to a Fabbri Booster, which they had last year, a very common and impressive fun fair ride, but this one is considerably bigger. At 213ft it’s a touch smaller than Power Tower, but it’s much more extreme. I had planned on skipping it, partly because of its £8 price tag and partly because the Booster last year wasn’t very good. I was very glad I did this one though as it’s on a whole different level. The concept is simple: a massive arm pinned at the middle, with seats on either end, rotating in a full circle. The seats can swing and also rotate in the axis of the arm. Obviously when one set of seats is on the ground, the other is 200ft in the air, and so each end is loaded separately, meaning you spend a good minute suspended in the air whilst the other end loads or unloads. The ride began fairly tamely, spinning slowly without any seat rotation, but about half way through it turns up a notch. There is a large fan under each seat which creates a huge whirring noise, presumably where the ‘Turbine’ name comes from. I didn’t notice it to start with, perhaps it was turned off, but eventually it blows directly on your legs, simulating a large g-force. Then you realise that the ride is accelerating, and our seats also began to rotate. The g-force gets really high, so much that I felt I was going to black out if it kept up any longer, but it slows down at just the right time and brings you back to earth. Having already spent all of my money we headed back, missing out a few rides I’d done the previous year, and a few that I hadn’t. The Starflyer was the most heavily advertised ride last year, but this year it’s just tucked away at the back. Right next to Air there’s a suspended roller coaster called Christmas Coaster; it’s a bizarre ride but worth a go. Of the new rides there seemed to be a couple worthwhile: The Haunted Mansion style ghost train was getting rave reviews, and there was an impressive looking inverting ride called Ski Jump, which seemed to be a cross between Air and a Swinging Ship ride. For the thrill seekers it would be great to have a wristband for unlimited riding, but clearly they’re making more money without and people like me are still willing to pay up. The food is good, I’m guessing the drink is good too, it has to be admitted that the roller coasters are tame, but the flat rides make up for it. I visited at about 2 in the afternoon, even at this time on a Thursday it was bustling, the queues were virtually non-existent but it was starting to get busy. If you’re just going for the rides then weekends are to be avoided, on week days any time before 4 usually means no queues. However if you’re after the festive atmosphere then evenings are a must; once it’s dark the place takes on a whole different life. Crowds have been far larger this year than last and I can only hope that the ever increasing interest means we can see some even better rides in the coming years. I’d definitely advise going along if you’re lacking things to do; it’s free to enter so why not! Hurry though; it’s only on until January 5th.